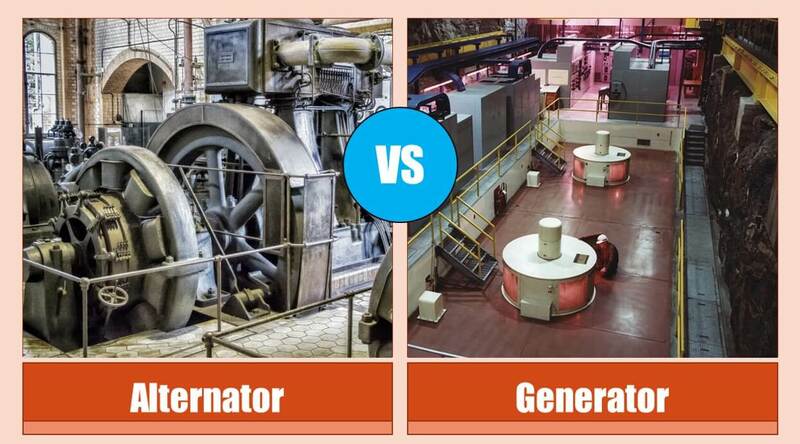 A generator is an electrical machine the converts mechanical energy into AC or DC electrical energy. On the other hand, the alternator is the type of generator which produces AC. Although generator is a general term used for any type of generator. Electrical Engineers often use Generator for representing DC generators and alternator for AC generators. In this post, you’ll learn the difference between both. Alternators are widely used in electrical power systems for generating ac electricity. The use of the DC generator is limited to battery charging, electroplating, and some old turbine systems. The output is alternating in nature, from power stations the output is fed to the transformers for stepping and then delivered to the consumers. The ends of coils are connected to slip rings that induce a voltage in the generating brushes. A prime mover turns the rotor of the generator and produces the rotating magnetic field in the machine. Working principle is based on Faraday’s law of electromagnetic induction which stays that a moving wire in the magnetic field has a voltage induced on it. The armature is a stator. Produces alternating emf on output. An alternator is used when bulk power is required. Generally used in power stations and automotive. Complex in design and working, require more maintenance. The output is constant dc. The ends of coils are connected to the commutator. All types of generators internally produce ac. However in dc generators, a commutator is used for converting ac to dc. The magnetic field is produced by electromagnets mound on the stator. The armature is a rotor. DC Generators are used for small power generation as in case of turbines or mobile stations required for battery charging. Used for electroplating and battery charging. Simple in design and required smaller maintenance.